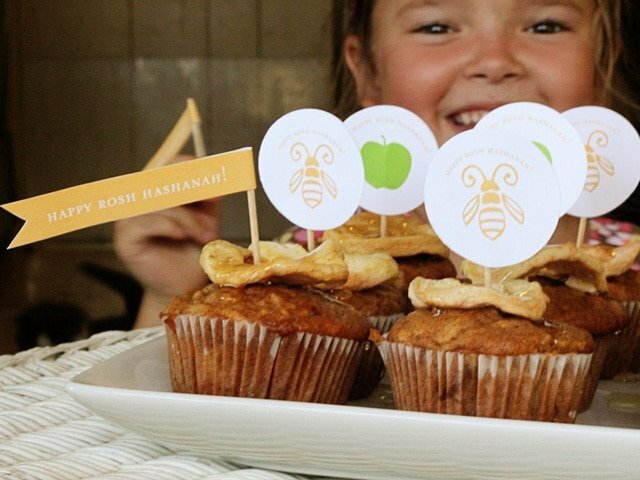 Honey Apple Cupcakes for Rosh Hashanah – Delicious High Holiday Cupcakes with Free Printable Decorations. Shana Tova! I’m so excited to introduce you all to my friend Brenda Ponnay. Brenda is a crafty, creative mom who writes the blog Secret Agent Josephine. She’s also a tremendously talented graphic designer and illustrator. 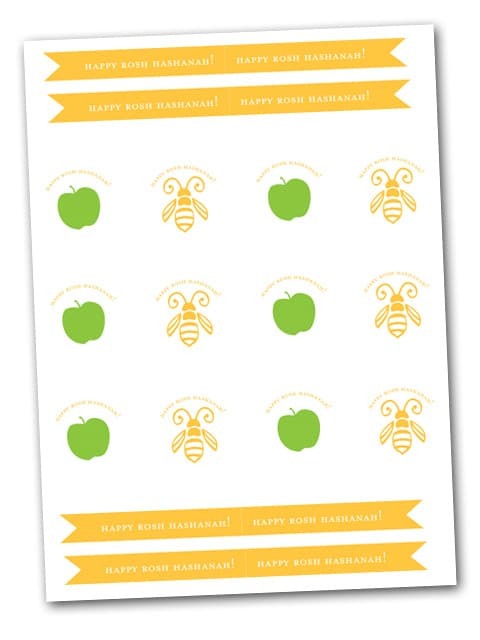 Brenda was kind enough to contribute a few fun family project ideas to my site for Rosh Hashanah. This series of posts is kid and family friendly; each project will help children learn the deeper meaning of the Jewish holidays. First up: Honey Apple Cupcakes! You know what kids like? Cupcakes. They love them. There’s just something about a little hand-held piece of cake that makes it more edible and delightful. Cakes are impressive but cupcakes are fun. 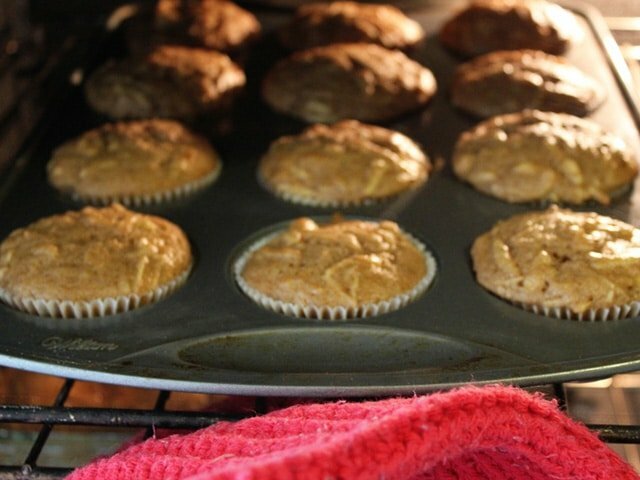 So for a little Happy Rosh Hashanah treat I decided to bake up Tori’s famous Honey Apple Cake (click here for recipe) into cupcakes instead of a bundt cake. I made these cupcakes with my daughter as a family project. Easy peasy fun! We decorated them with some homemade printables (which I will share below) and ate them right up. They were tasty! First I printed out the recipe. Then I gathered the ingredients. 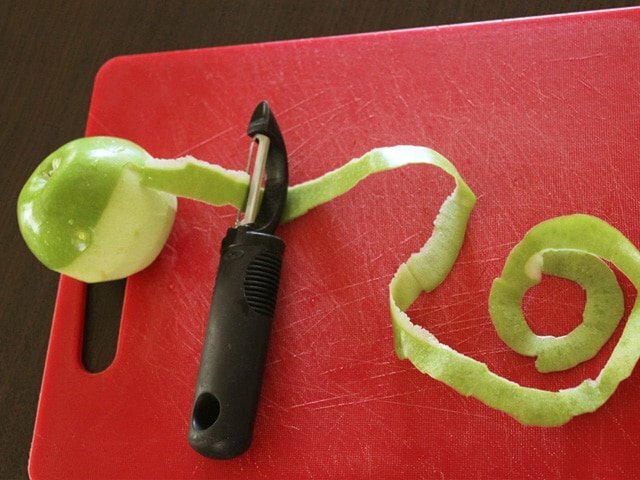 I had some fun trying to make super long apple peeling art. 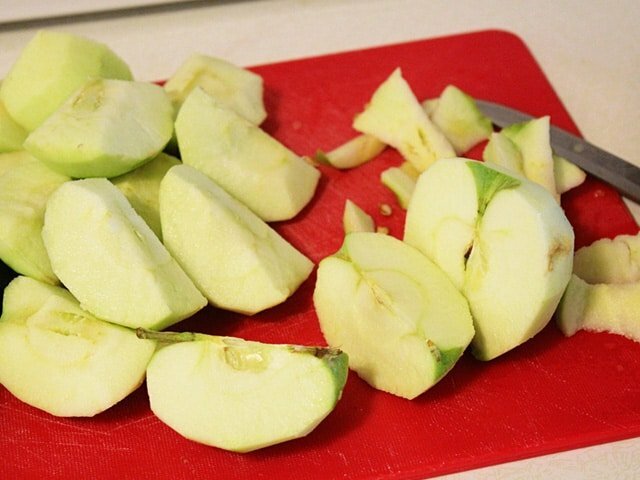 Then I cut the apples and cored them. And then shredded them with my handy dandy cheese grater. I mixed up the rest of the batter according to the recipe and then popped them in the oven. By filling the muffin tin 3/4 of the way full the recipe made about 24 cupcakes. While the muffins baked, I got to work doing what I do best: making paper things! I’m a graphic designer by trade so the paper goodies always make my world go around. 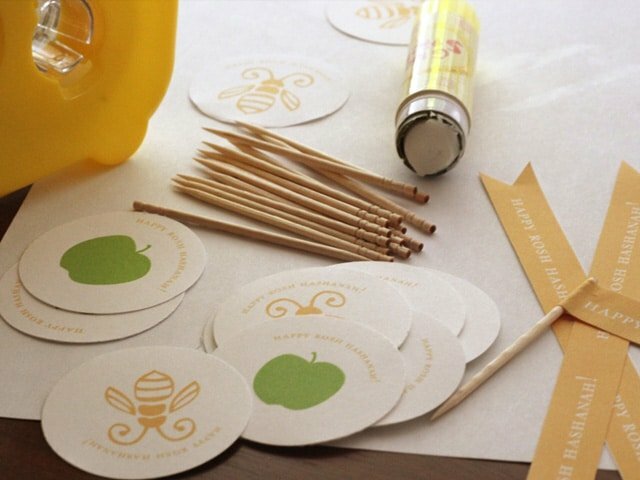 I made some little honey bee and apple symbols. I cut them with a circle hole punch; you can hand cut them if you don’t have a large hole punch. Then I pasted them together with a glue stick (you can also use double-sided tape) onto toothpicks. I made some tiny flags that said “Happy Rosh Hashanah!” and glued those to some toothpicks as well. If you’d like to play along at home, click here to download your own printable! 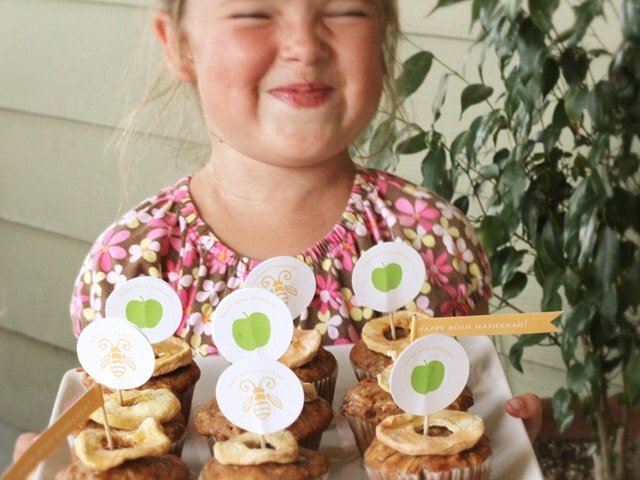 When the cupcakes were done baking and had cooled, my daughter and I decorated them with dried apple slices and a generous drizzle of honey. Then we stuck in the cupcake picks and lined them up on a pretty plate. But what you don’t see here is the discussion my daughter and I had about Rosh Hashanah, and the importance of honey and apples in the Jewish New Year. Click on the link above and print the recipe for Tori’s Honey Apple Cake. Prepare cake batter as directed. Line a cupcake tin with cupcake papers. Fill each paper about 3/4 full with batter. Bake cupcakes for about 25 minutes till a toothpick inserted in the center comes out clean. This will make about 24 cupcakes. 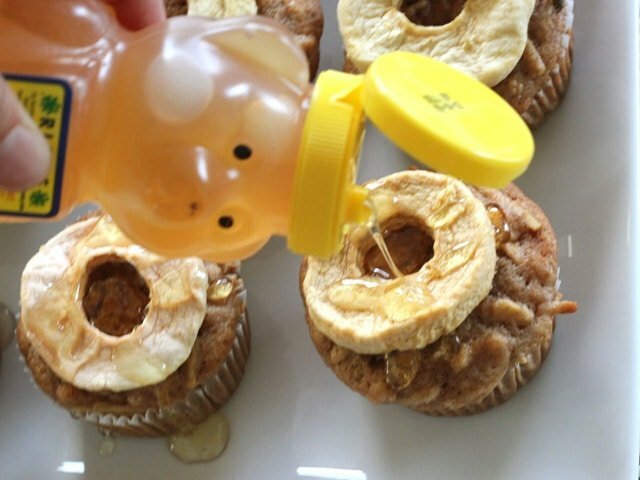 Buy dried apple rings, honey, and toothpicks to decorate the tops of the cupcakes. Print 4 copies of this sheet in color; this will make more than enough double-sided printables for 24 cupcakes. 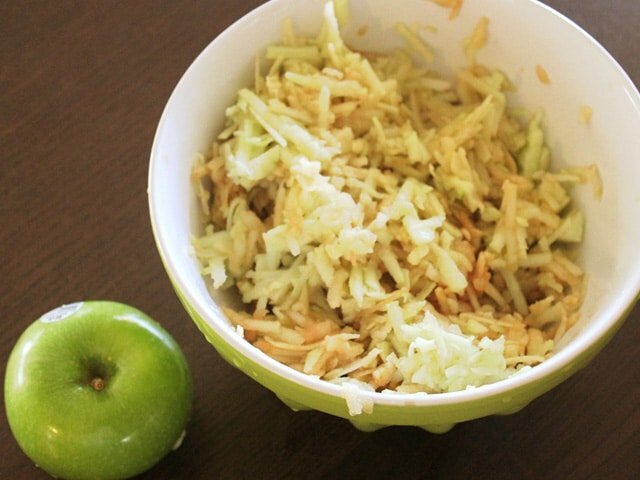 If you are not familiar with Jewish tradition, this page will help you explain Rosh Hashanah to your child, and why apples and honey are part of the Jewish New Year tradition. Such a cute idea!!! Will try next year! These are so cute! Can you make these ahead of time and freeze? Hi! Can you make these cupcakes GF by any chance? Hi Jennifer! Try subbing a gluten free baking flour like King Arthur for the flour here, it should turn out great. Enjoy! I tried to download the images but the pdf file is not opening. I’d love to make the cupcakes for my holiday celebration. Thanks for this wonderful site. Happy, healthy New Year. YUM. And bonus, something new to do with all the apples our tree is producing! Amazing idea! I love it and am so doing this for next Rosh Hashanah. L’Shana Tova! Tori, I’m afraid I can’t send a photo due to privacy issues, but we made the cupcakes and they came out great! I had to pass out the recipe to all my parents. If I can make it with 12 three year olds, anyone can make it. I look forward to your Sukkot ideas. I love the apple circles on top of the cupcakes – a lovely touch! I loved the idea of smaller portions so I baked these for Rosh Hashanah. I would recommend a shorter cooking time. Mine are a little dry. My problem may also have been that I sqeezed alot of the apple juice out before adding to the mix. I have too many nightmare apple cake memories that were gummy inside due to too much juice from the apples. I bought a can of caramel frosting and my husband is very happy with the cupcakes now! I will try again because the flavor was great! Thank you! Eons ago, I baked for a Jewish temple near my home. When Rosh Hashanah came, they ordered 40 loaves of honey cake one week. I wish I had had this recipe then!! Just finished making these and had my first bite. They are wonderful! I can’t wait to share them with friends tomorrow night! I just made the cupcakes and they are delicious! I put half of them in the freezer to use for Yom Kippur. These look delicious. I love honey in cake and that face on your daughter is precious. I’m going to make these with my preschool class. Does the cooking time need to be shortened for cupcakes? Your daughter is a living doll!!! Too cute. And these look like fabulous cupcakes…and I’m loving those printables, too…so nicely designed. These cupcakes look so cute and yummy! I love Brenda’s printables! What a fun way to decorate these cupcakes! These cupcakes look amazing and I absolutely love the adorable print outs! Yum!! cupcakes are indeed wonderful (they can help with portion control :)! Thanks so much for sharing the information about Rosh Hashanah. I love the honey bee art…oh so cute. Wow, those look really tasty with the honey and apple slice. This is a great post-you and Brenda make a super team! 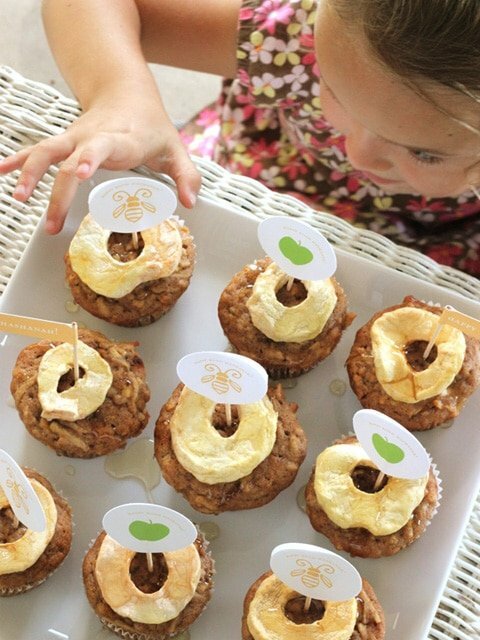 I love the way you decorated these and apple cupcakes sound divine.That picture of your daughter is priceless! Tori, these are awesome. What a great mom you are too! What delicious cup-cakes! Your print-out is super and your daughter is SO cute! I’m with you….there’s something about a cupcake that is wonderful! A little gift beautifully decorated! Yummy! 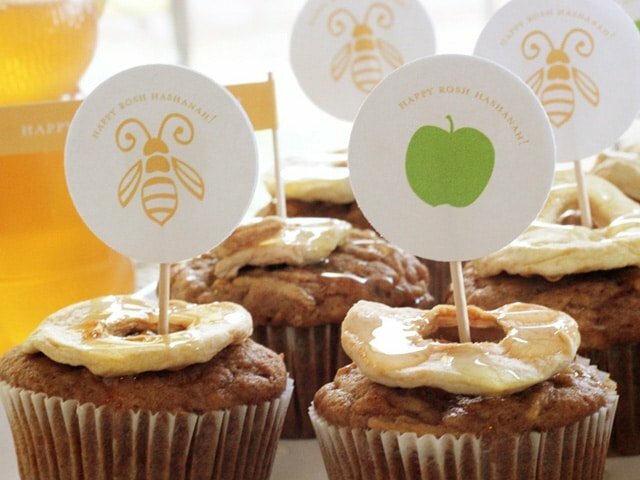 These cupcakes sound so good that I could happily eat them any time of the year, but they sound like an absolutely perfect Rosh Hashanah dessert… especially with those super-cute printables! What a great way to introduce kids to the meaning behind apples and honey.